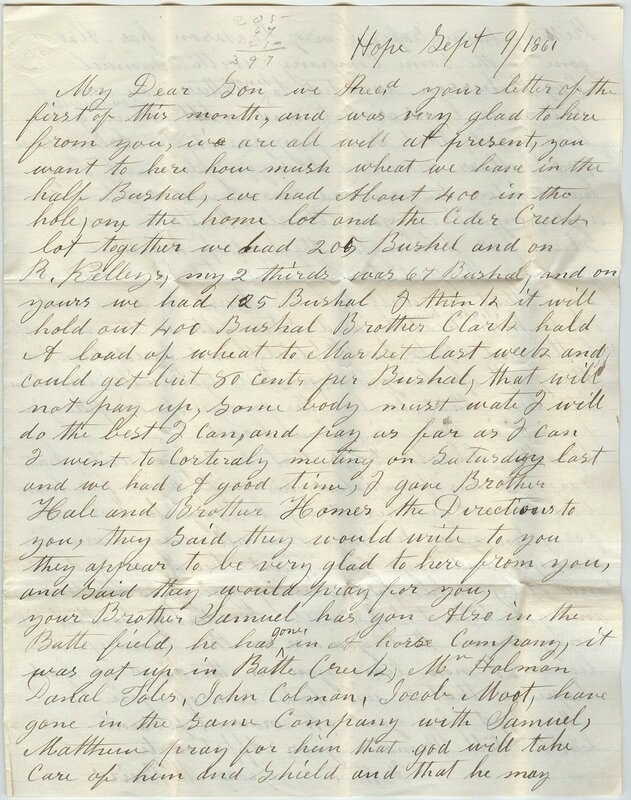 Below is a letter written by George Baird, to his son Matthew. George was born in 1815 in New York and died shortly after the end of the war in 1866. He mentions several of Baird’s siblings and details about life at home and friends he interacts with in this missive. There is very little punctuation in the letter, as you will see if you take a peek at the image, and George spells a some words phonetically. Samuel Baird, Matthew’s younger brother by 2 years, enlisted in an independent cavalry unit called the Battle Creek Squadron of Light Horse (according to later letters). That unit was eventually absorbed and Samuel found himself in Company H, “Merrill Horse” or the 2nd Missouri Cavalry in August of 1861. He completed his training in Missouri at Benton Barracks from September – December. To see a full list of those that served in Merrill Horse click here. He spent the next four years of active duty in the western theater of the Civil War, including Missouri, Arkansas, Western Louisiana, Kentucky and Tennessee. Samuel reenlisted in January of 1864, was promoted to Corporal in December and was discharged in September of 1865, when he returned to Cedar Creek. He went on to have three wives and live in several cities around the Midwest, passing away in 1923. George also mentions Thomas and Lucy, Baird’s youngest siblings, born in 1851 and 1855 respectively. With the death of both of their parents in the mid-1860’s, there are several years where both Thomas and Lucy are difficult to locate. Thomas was too young at the time of the conflict to be involved in the war and is listed as a railroad laborer in the 1870 census. Lucy does not appear again until her wedding record in 1873. Thomas had two wives and one child before passing away in 1924. Lucy and her husband relocated to Los Angeles, CA between 1880 and 1900 with her two daughters Minnie and Flora. Lucy passed away in 1923.